The Find Text window lets you find a specific part of your text. This can become very handy when you have a large number of captions and text in your project. Lets you type in the word to search. Lets you type in the word that will replace the word you are searching. The case of the word is included as a search factor. This is where information about the search is displayed. Searches for the word in the forward or backward direction. Locates the first word found in the search and displays it in the Storyboard or Panel view. The word is highlighted in blue. 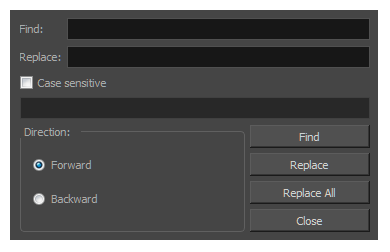 Replaces the searched word with the word you specified in the Replace field. Replaces all instances of the word you are searching and replaces it with the word you specified in the Replace field.